On April 30th, I along with other equally inspiring women, had the opportunity to speak and share my work with over 400 young girls from the NY Tri-State area at the Cedarmore Corporation’s annual Girlz Talk event. The Cedarmore Corporation, a non-profit organization dedicated to serving youth and families across Long Island, holds a youth empowerment event every year, that is strictly for young ladies. 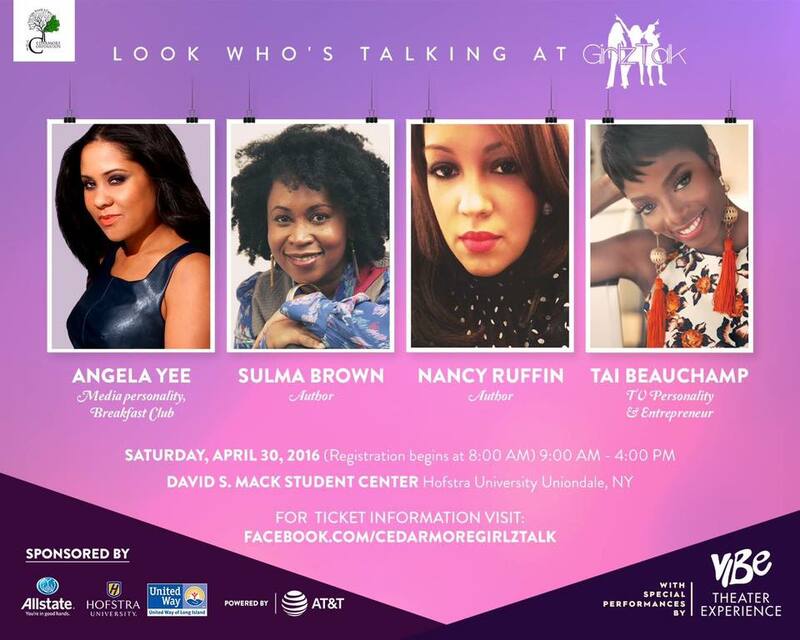 Through interactive workshops, dynamic keynotes and other creative executions, Girlz Talk, which is promoted as a day of critical and culturally relevant conversations, is designed to educate and empower young ladies from diverse communities, ages 12-18+. Girlz Talk seeks to narrow the information gap that exists in their lives by addressing the most pressing issues that girls face as they continue to grow and develop. Some of the topics on the agenda included Education Attainment and Income, College Preparedness, Self Esteem, Goal Setting, Decision Making, Personal Branding, Mental Illness and Developing Healthy Relationships and more. When I arrived Saturday morning at Hofstra University I was very excited to meet the young ladies and share my work with them. The Manifest Your Life Vision Board Workshop I facilitated was full to capacity. Many of the young ladies who attended had never created a vision board before and those who had were only familiar with gluing images on a poster board, not realizing how important it is to actually write down their goals. One of the exercises I do at my vision board workshops is have the participants write out three goals they want to accomplish and then list the steps they think they need to take to accomplish them. I had the girls complete the exercise because I wanted to teach them that it’s important to create a road map of where they want to be and how they’re going to get there. Without a plan it is very easy to get sidetracked. Most of us have dreams, but many of us don’t know where to begin or how to take that first step. This workshop was focused very specifically on helping the young ladies identify their dreams and then taking that dream and breaking it down into smaller, more manageable goals. Whether it’s daily, weekly, monthly, or annually all successful people set goals. They wake up each morning with a to-do-list and begin tackling each item until it is completed. Successful people wake up and they’ve already planned their day, while unsuccessful people are scrambling to figure out what they need to do next. Their goals are very specific, big yet attainable and are aligned to their strengths. Knowing where your strengths lie is key to achieving success. Know what you are capable of and invest all of your efforts in it, avoiding your weaknesses. Your dream is your destination, your goals are the road map that will get you there. For more info on the Cedarmore Corporation’s Girlz Talk event visit their Facebook page. For the past few years vision boards have become very popular, primarily because they work. The reason they work so well is that they help to keep you focused on your goals. Creating a sacred space that displays what you want actually does bring it to life. What we focus on expands. When you create a vision board and place it in a space where you see it often, you essentially end up doing short visualization exercises throughout the day. I have been using vision boards since 2011 and since then have seen so many great things come to life for me. Everything that I’ve put on my vision board has become my reality. I manifested my greatest desires by remaining focused and committed and I want to help others do the same. Many of us live day to day without really giving much thought to our dreams and desires. Life seems to get in the way and between shuffling the kids back and forth to school and activities, being a wife, taking care of home, or handling business at the office many women just don’t pay attention to their passions. It’s time that we stop giving so much of ourselves to others and give a little bit back to ourselves. It’s time to stop floating through life and learn how to live each day with purpose. The theme for 2016 is LIVE ON PURPOSE. Discover your God given gifts and learn how to use them to create the life that you dreamed of. The power of INTENTION is real. What you focus on is what you call into your reality. Join me on January 24, 2016 at Katarina Bar & Grill in Queens and learn the secret to manifesting your dreams through the use of vision boards. I promise, you will leave the workshop focused and ready to conquer 2016. And if you’ve ever been to any of my events you know that I always make them fun and memorable. And you might even leave with some goodies. Don’t know what a vision board is? Don’t know how they work or the benefits they provide? Vision boards have proven to be a useful tool to help clarify, concentrate, and maintain focus on a specific life goal. I will teach you how to identify your vision/dreams/goals for the upcoming year. I will help you to set clear, specific, and realistic time frames. I will teach you how to reinforce your vision through the use of daily affirmations and how to use the vision board to help keep your attention on your intentions. Early bird discount registration is currently available so reserve your seat now by visiting our event page on Eventbrite.